The news hit at the beginning of November 2015: Julio Rodriguez, Reserve General between 2008 and 2011, the highest ranking military officer in Spain, signed for Podemos, the formation that at that time was revolutionizing the Spanish political scene. Attacks of all kinds were not long in coming. From the government, which announced that it was dismissing Julio Rodríguez “because of a loss of confidence and suitability”, - in fact the general had requested his retirement a week earlier - to those who, from all sides, were publicly surprised that a military man could have a left-wing political sensibility. 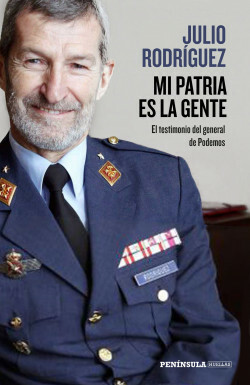 From a very personal, free, courageous and honest point of view, the “General of Podemos” explains in this book the reasons that led him to make the decision to join the purple party, a life choice that cannot be understood without going back to his childhood and youth in the barracks, his relationship with his father - an aviator who fought in the Spanish Civil War with Franco -, his entry into the army during the dictatorship, his process of ideological formation and the years in which he was called “Julito the Red” for his ideas. But also his vision of the transformation of the Francoist army into a democratic armed force, his participation in international missions, his experience as JEMAD (Chief of Defense Staff) of Zapatero’s government, his work as head of operations during, for example, the Alakrana crisis in the Indian Ocean... And many other decisive events in Spanish public life that the former General has witnessed firsthand, and which he now dares to count, without the constraints of the stripes, and to analyze from the perspective of his current political commitment. For the first time, a top military officer identifies and denounces the shortcomings of our military establishment and defends the idea that “another army is possible”.